WASHINGTON -- Today's sustainers live and operate in a multi-domain environment. Successful completion of the sustainment mission hinges on a holistic approach across the spectrum of land, air, maritime, cyberspace, and space domains. The Army's Multi-Domain Battle concept, which is being developed under the leadership of the Army Capabilities Integration Center, focuses on the character of war in the 2040 to 2050 time frame. This will be a fight against a near-peer adversary, but the theoretical applications of Multi-Domain Battle doctrine are not just theoretical; they are in daily use today. The battles to defeat the Islamic State group and liberate the cities of Mosul, Tal Afar, and Raqqa are all multi-domain fights. The Army's sustainers are actively integrated at multiple echelons supporting the fight through seamless integration across the land, air, maritime, and cyberspace domains to enable the fight. This is their story. The Combined Joint Task Force-Operation Inherent Resolve, also known as CJTF-OIR, mission is to defeat the Islamic State group in designated areas of Iraq and Syria and to set conditions for follow-on operations to increase regional stability. This is a multi-domain fight involving coalition forces, Iraqi Security Forces, known as ISF, and Syrian Democratic Forces, known as SDF. The battles to seize and clear Mosul, Tal Afar, and Raqqa provide an excellent backdrop to describe the Army's sustainment support in a multi-domain environment. The seizure of Mosul was a challenging nine-month urban operation for the ISF. Despite stubborn Islamic State group resistance and complex urban terrain, the ISF proved to be a resilient and professional force. Throughout the campaign, the ISF not only regenerated lost combat power but also continued to build new combat brigades for future fights. Following a brief tactical pause of a few weeks to refit and reposition, the ISF postured for a multi-prong assault using three Iraqi army divisions to seize and clear the city of Tal Afar and the surrounding area. 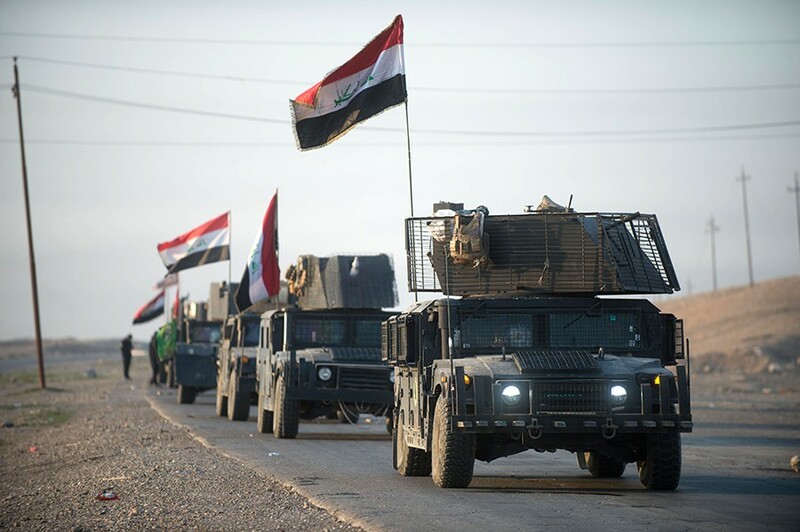 Although this was expected to be another tough urban fight, the ISF masterfully maneuvered and drove the Islamic State group from their last stronghold in the north in an eight-day operation. The SDF has used a similar method to grow its capability and strength. The SDF is a light infantry force, and it has expertly maintained the initiative over the Islamic State group through its ability to amass forces while simultaneously providing critical mission command. The SDF's air assault seizure of key terrain near Tabqah Dam and the follow-on clearance of Raqqa is a perfect example of integrating multiple assets into a multi-domain battle. Through its ability to blend multidimensional warfighting, it created a window of opportunity that led to its ultimate success. Through all of these fights, the CJTF-OIR coalition used a wide array of multi-domain enablers to facilitate the success of coalition partner forces, the ISF, and the SDF. These enablers encompass an array of tools across the warfighting functions to include sustainment. The traditional domains of land, air, and maritime have always been part of the Army's combat operations. While land combat is a core competency, the Army routinely uses the air and maritime domains to create windows of opportunity for land forces. Within the CJTF-OIR area of operations, coalition forces rely heavily on ground and air lines of communication, known as LOCs. However, those LOCs are occasionally disrupted by weather, political sensitivities, and enemy activities. To overcome these frictions, the Army's sustainers are seasoned to look for innovative ways to achieve logistics dominance by, with, and through partner forces. The air domain is a frequent solution for supporting the SDF in Syria. In the past 12 months, the Army conducted over 100 airdrop missions that deployed more than 1,000 bundles of supplies to various geographically dispersed forces and isolated elements. By doing so, sustainers were able to provide a range of mission-essential supplies including meals, water, ammunition, and fuel. Airdrop, in addition to rotary-wing resupply operations, will continue to be a key sustainment enabler in the air domain. While the maritime domain may seem absent from the CJTF-OIR's arid environment, it became a critical domain during the initial stages of the Raqqa campaign. The air assault across Lake Asad to seize Tabqah Dam was a classic example of creating a temporary window of superiority over Islamic State group forces. However, Lake Asad presented a geographic obstacle for Army logisticians supporting an isolated force. With limited air assets and no ground routes available, they established a tactical sea LOC using Zodiac boats. The waterborne movements were critical to the fight by transporting personnel, equipment, and key resupply. Coalition forces have since established a ground route to support forces on the other side of Lake Asad, but the sea domain technique remains a viable option in the future. During an Association of the United States Army hot topic session on June 30, 2017, Joshua Marcuse, the executive director of the Defense Innovation Board, challenged the audience "not to think about moving stuff, but to think about moving data." Recent history and operations have highlighted the importance of mastering the cyberspace domain in order to achieve logistics success and sustain the fight. Furthermore, during discussions about future near-peer conflicts, Army leaders agree that concentrated logistics operations should be avoided to prevent targeting. Although the threat of the Islamic State group targeting logistics sites exists, the Army avoided concentrated logistics operations in Mosul, Tal Afar, and Raqqa for a completely different reason. The CJTF-OIR's operational environment has limited ground and air LOC capacity. As a result, logistics mass is not feasible, and the Army has been forced to prioritize the exchange of information in order to provide a more responsive requirements process. This process hinges on cyber connectivity and integration before the physical distribution of materiel even begins. Data exchanges between partner forces and supporting coalition forces enable the coalition to procure and distribute critical equipment and supplies as needed. In this environment, requirements visibility and efficient distribution replace logistics mass. Internet portals, email, video teleconferences, and the iPhone Facetime application have all become routine cyber tools that are used to communicate with partner forces. The Army views these tools as a way to facilitate traditional methods of communication in an expedited manner. As coalition forces move forward, they are looking for innovative ways to leverage commercial technologies in order to improve sustainment data feeds. The Iraqi telecommunications network has made great strides in the last decade. U.S. teams are looking for ways to harness the local network to provide a system for in-transit visibility, known as ITV. In the CJTF-OIR area of operations, we see a possibility for a capability similar to how Amazon links orders to the UPS system to provide ITV. The existing radio-frequency ITV network is robust, particularly in the Kurdish regions of Iraq. If coalition forces can link the unclassified ITV database to the ITV network, they would be able to track requirements from initial request to final delivery. This would foster additional transparency, trust, and accountability among our partners. Another cyber tool in our arsenal focuses on enhancing logistics security. The Army initiated the use of Secure Electronic Enrollment Kits, known as SEEK, on the Northern Distribution Network, a contractor-managed Kurdish regional route that provides a ground LOC from Erbil in Iraq to a major logistics node in northern Syria. The Northern Distribution Network had little military supervision, so the Army sought ways to oversee who was managing its cargo on the route. SEEK biometrics improve contractor vetting efforts by screening drivers and passengers at pickup, border crossings, and delivery points. Since SEEK was implemented, coalition forces have been able to apprehend multiple Islamic State group sympathizers on the ground LOC, thereby safeguarding cargo. Lastly, there is the information domain. The Army views its efforts in this domain as passive, not active. The information domain is a dynamic landscape of tribal, cultural, religious, and political tensions. Sustainers and contracted vendors navigate this complex domain daily as they transit the region and acquire, store, distribute, and deliver needed cargo and services. Daily engagements with the people of Kuwait, Iraq, and Syria put sustainers on the front line of CJTF-OIR messaging. This interaction helps the Army to remain ahead of enemy forces because of the coalition's message -- that it is here enabling its partner forces to defeat the Islamic State group -- is heard first. Gen. David G. Perkins, the commanding general of the Training and Doctrine Command, states in his July-August 2017 Military Review article, "The Multi-Domain Battle concept will continue to improve our capabilities across warfighting functions so we can arrive on the future battlefield as a converged and integrated joint force, one step further and one step faster than our enemy." The Army is the world's preeminent land power that fights and wins wars as part of the joint force. Army forces are able to integrate, synchronize, and optimize the efforts of multiple partners. The Army's mission in Iraq and Syria is nested in those two top-line messages. As the Army prepares for future fights in this complex world, it must be prepared to fight and sustain across multiple domains. Today's sustainers embrace multi-domain concepts in order to holistically support the force and maintain operational momentum over the enemy. Brig. Gen. Christopher J. Sharpsten is the CJ-4, director of sustainment, for the CJTF-OIR. In previous assignments, he commanded the 3rd Expeditionary Sustainment Command at Fort Bragg, North Carolina, and served as the Department of the Army G-45/7 responsible for Army logistics force structure, doctrine, and strategy development.